The 11th edition of the M1 Asian Netball Championships (M1 ANC) commences today with all 12 nations competing in the tournament geared up and ready to take each other on at the Singapore Sports Hub from 1-9 September. 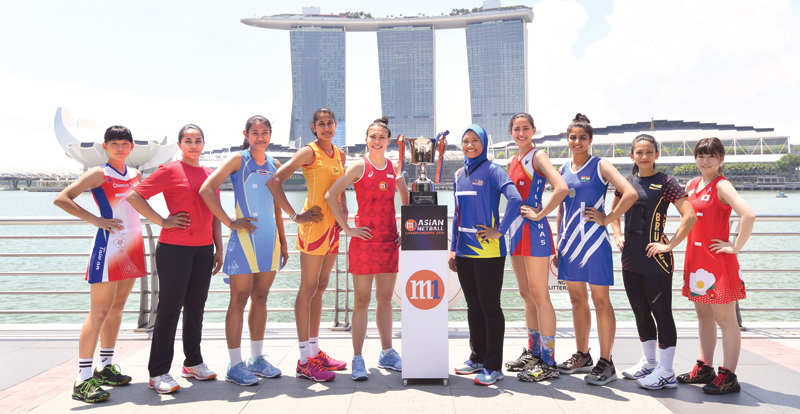 The team captains from the various competing countries come together today for a glimpse of the elusive Asian Netball Championships trophy in front of the iconic Marina Bay Sands. Team Singapore will take on Brunei in the first match on opening day at the M1 ANC at 1pm, followed by Malaysia against Japan, before Chinese Taipei contest Sri Lanka. The final game of the day will see Philippines battle it out against Thailand at 7pm. Top trophy contenders are Singapore and Malaysia – the defending champions of the Asian Netball Championships – and Sri Lanka – who have won the most number of Asian Netball Championship titles (4).